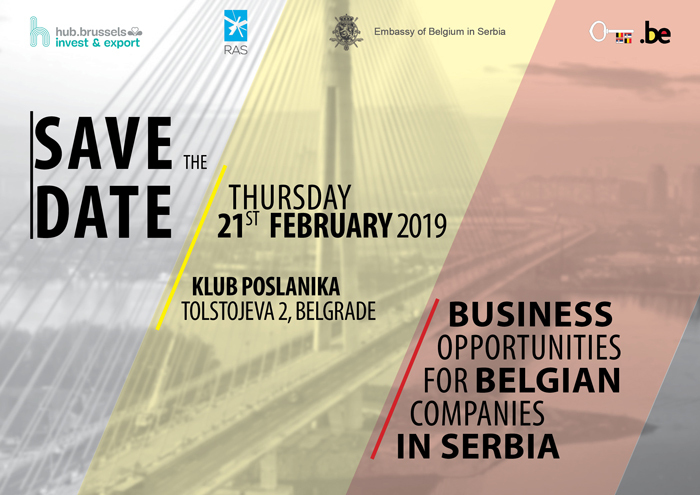 We have a great pleasure to invite you to the presentation on “Business Opportunities for Belgian Companies in Serbia” jointly organized by the Development Agency of Serbia, Economic and Trade Office - Embassy of Belgium, The Embassy of Belgium in Serbia and the Belgian-Serbian Business Association to be held on February 21st, 2019 at Klub poslanika, Tolstojeva 2, Belgrade. With the aim to present and to give guidance on the subsidies and support programs the Development Agency of Serbia is providing to the Belgian companies that are doing business in Serbia as well as to the Belgian companies interested in setting up or expanding their presence in Serbia. The event will include individual meetings with the RAS Advisors. Presentation of the Regulation on the conditions and method of attracting foreign direct investments, as well as individual meetings will be held in English. You can download registration form and register through the mail. For a copy of the agenda please follow the link. We are looking forward to your confirmed participation. The detailed program and agenda will follow soon. Should you have any questions in the meantime, please feel free to contact Ms. Vranjanac m.vranjanac@bsbiz.eu or Ms. Tufegdžić belgrade@hub.brussels.